Justin Bartha wears black low cut Converse “Chuck Taylor” All Stars in the film. Ben and Riley check out the security surrounding the original Delaration of Independence. 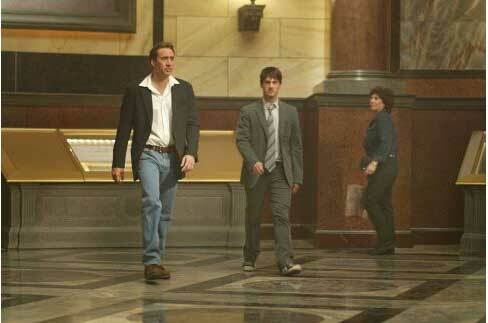 National Treasure is a film very much in the tradition of the Indiana Jones adventure films. Benjamin Franklin Gates (Nicholas Cage) is seeking a fantastic treasure lode that had been passed on to our founding fathers, the signers of the Declaration of Independence, by the Knights Templar, a special sect of the Free Mason order. Gates’ family became involved in this quest when back in 1832, Charles Carroll. the last surviving signer of the declaration and a Mason, knowing that he was about to die, tried to deliver the clue to where the treasure was hidden to then President Andrew Jackson. Unfortunately President Jackson wasn’t at the White House, so the clue was given to the only person present at the time, Gates’ grandather’s grandfather, Thomas Gates. Thus began the search by members of the Gates family, with the secret passed down from generation to generation. It wasn’t until Gate’s father (Jon Voight) stopped actively seeking the treasure (“fools looking for fool’s gold”) that things temporarily came to a halt. In an opening flashback scene, we see a young Ben Gates searching through the attic of his grandfather’s Washington, D.C. home looking for information about the story. When confronted by his grandfather (in a great cameo performance by Christopher Plummer), Ben tells him he wants to learn about the story of the treasure and when his grandfather senses he is serious, tells him the story of the clue and has him take an oath to search for the treasure. “The secret lies with Charlotte” was the clue passed on by Carroll, and soon the film cuts to the Artic Circle, and the present, where an expedition led by Gates is searching for a lost ship named “Charlotte” believed frozen in the ice of the Artic Ocean. Gates is being financed by his boss Ian Howe (Sean Bean), and helped by his sidekick and technical genius Riley Poole (Justin Bartha) who has figured out how to locate the ship. The expedition is successful in finding the Charlotte, and when they dig enough of it out of the ice to enter, they find frozen crew members and a cargo hold where there are hoping the treasure lies. But all they find is barrels of gun powder and a wrapped case containing a meerschaum pipe, carved like a ship. The pipe is yet another clue, with an inscribed riddle, that must be solved to continue the search. The riddle refers to a hidden map and suggests that it is contained on the Declaration of Independence. Howe believes that the only way to examine the Declaration is to somehow steal it. When Gates balks at this idea, the two feud and the ship gets blown up when a flare is dropped into the gun powder. Although Howe and his cronies think that Ben and Riley have been blown up in the explosion, they are able to escape and travel to Washington, D. C. to try and warn the government about Howe’s intentions. Frustrated by the government response to their information, Ben and Riley discuss their options. At the National Archives, they meet up with Abigail Chase (Diane Kruger) under assumed names and attempt to convince her that there is writing on the back of the document. She is unconvinced (as were the FBI and the Department of Homeland Security) and so Ben, frustrated, decides that he will steal the Declaration to prevent Ian from stealing it first. Riley is incredulous and tries to talk Ben out of it. At the Library of Congress, he shows Ben all of the security precautions surrounding the Declaration. But Ben reminds Riley of Thomas Edison, and how it took him 2000 tries before he came up with the filament thread for the light bulb. He figures that they can get it by accessing the preservation room where the document is worked on and while there is less security during a gala event scheduled for that weekend. Riley goes to work and is able to tap into the archive security. This is a great set up for action, as now we have two teams going after the Declaration, the good guys and the bad guys. This next part is one of the better sequences of the film, as we see how both teams are able to get past the security and into the Preservation Room where the Declaration is kept. Through his own ingenuity and a little bit of luck, Ben is able to get the document, but Ian’s team has also been able to get in another way (so much for our homeland security!). When they discover that they have been beaten to the Declaration, Ian’s team goes in hot pursuit of Ben, Riley, and Abigail, who gets sucked into the events when the government discovers the theft and she follows Ben out of the building. She is grabbed by Ian’s team who think she has the Declaration and eventually rescued by Ben and Riley. Meanwhile, the FBI, led by Agent Sandusky (Harvey Keitel) gets involved now that the real document is gone, and their presence adds another element to the chase scenes and intrigue of the story line. It would spoil the effect of the film to reveal any more of the story, but you can be sure there is non-stop action until the end involving these three groups. The interesting twist of this film is that everything is occuring in the United States and involving our national symbols, history, and places of interest. Riley goes off to penetrate the security around the Declaration of Independence. National Treasure was produced by Jerry Bruckheimer and Disney, so you see lots of action in a family-friendly sort of way. The good guys are really nice, and the bad guys led by Sean Bean are bad, but in true Disney fashion even the bad guys have some manners even as they are threatening violence. Ben Gates is a good role for Nicholas Cage, who has done a several of the these types of films now. The conversations between the team of Ben, sidekick Riley and love interest Abigail constantly spout facts about history, technology and security, so if you are worried about spending your time watching a mindless adventure, at least be reassured that there is lots of real information threaded through the story line. The best supporting role is given by Harvey Keitel, as the FBI agent in charge, who plays his role in a deprecating manner, and occasionally brings us back to reality. It’s great when he dead-pans to Gates, during an interrogation, “Somebody’s got to go to jail.” or when he replies to his subordinate who tells him that the FBI disregarded Gates’ warning about the theft because they didn’t find the information credible, “How about now?” If you want you can pick apart little plot flaws here and there, but if you want total historical accuracy you shouldn’t be watching fiction in the first place. Just like the Indiana Jones series, it’s part of the movie’s conceit and genre to freely mix real history with the fictional story line. Jon Turtletaub keeps the action going for most of the film, except for the climatic scene at the end, where the camera work needs to be simpler. The best thing about this film is that is does keep your attention throughout, and even though it is over two hours long, there is always something new to deal with. So get yourself some popcorn, a cool drink and enjoy! Abigail, Ben, and Riley discuss their future. Riley helps Abigail get up. Justin Bartha in his role as Riley, the technical genius, wears black low cut chucks throughout the film. They are his favorite shoe and perfect for his character as he wears them with all kinds of outfits from dress suits to jeans and a sweatshirt. Much of the film is shot in wide angle shots, so there are not a lot of closeups, Probably the best scene is when Riley and Abigail are trying to escape from Ian’s goons. She accidentally drops the Declaration into a Philadelphia street, and when she is about to be run over by a large truck Riley is able to grab her and they dive into the curb. Riley and Abigail dive for the curb after escaping from traffic. National Treasure. (2004) Nicholas Cage, Diane Kruger, Justin Bartha, Sean Bean, Jon Voight, Harvey Keitel, Christopher Plummer. Directed by Jon Turteltaub. Categories: Action/Adventure.